CRYSTAL CHANDLER is a "knock-out" luxe jeweled frame with hundreds of hand applied clear Swarovski® crystals set in a beautifully cast pewter linked motif. Rich gray moiré silk back. Dual easel back. Elegant bevelled glass lens. Signature gift box. An original design frame from the Olivia Riegel® collection. 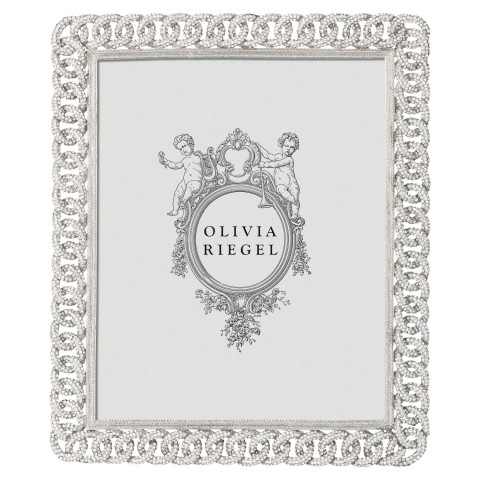 Frame size: 10.25" x 12.25"
Cast pewter chain pattern in silver finish with hundreds of hand-set clear Swarovski® crystals. Gray moiré silk back with easel for vertical or horizontal placement.